Here are the top games to watch for Week 7 of the high school football schedule (Sept. 28). Canyon Springs at Desert Pines, 7 p.m.
Could this be the Northeast League title game? The Pioneers have had a stranglehold on the division two years running, but haven’t had teams as talented as Desert Pines in it. The Pioneers have won all eight league games over the last two years by an average margin of 38 points, but have struggled against nonleague 4A opponents. Desert Pines has also dominated league play, but the Jaguars are the ones moving up. They have also not lost a league game in two years, and have fared well against 4A teams. Desert Pines is 4-2 against such teams, with the only losses coming to Arbor View and Liberty. Now the Jaguars will play 4A teams all season long. Chaparral at Green Valley, 7 p.m.
Another team moving up from the 3A ranks, Chaparral will look to prove it belongs in its first Southeast League game. The Cowboys went 7-3 last year and reached the state semifinals in 2016, but faces one of the toughest schedules in its history. This is their first 4A league game since going 5-32 from 2008-11. Realignment didn’t particularly help Green Valley. The Southeast is still brutally competitive, and it’s tough to project which four will emerge to reach the postseason. 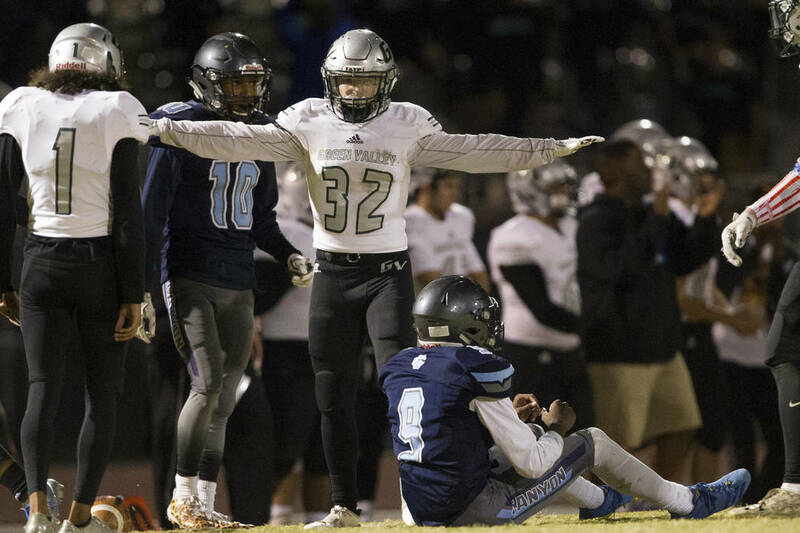 Green Valley has earned the benefit of the doubt after a 10-2 season, but cannot afford an early slip-up. Sunrise Mountain at Moapa Valley, 7 p.m.
Sunrise Mountain returns to the Sunrise League after two seasons in the Sunset, and meets one of the perennial favorties. The trip to Overton is never an easy one, and the Miners split their two games their last year, losing the season opener 13-12 and winning the playoff opener 30-28. After two games being decided by a total of three points, this should be a fun one. Last year’s 6-3 season was the Pirates’ worst in more than a decade so the standards at Moapa Valley are high. They don’t like losing at home, and will look to get a leg up on a hyper-competitive Sunrise.